I’m often asked where my interest in the American Civil War comes from. 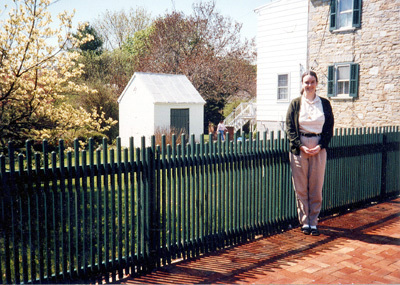 I grew up in Maryland, so I had lots of opportunities to visit Civil War battlefields. Since Maryland was a border state, I also had plenty of opportunities to consider the experiences of people on both sides of the conflict. And in addition to learning about the soldiers’ lives, I always tried to imagine what it was like for civilians who found themselves in the midst of fighting. I spent about ten years collecting stories about the civilians who lived in Western Maryland during the Civil War. All that research eventually led to my only nonfiction book, Too Afraid to Cry: Maryland Civilians in the Antietam Campaign. Several of the stories I discovered involved young people and would, I thought, make great novels. I was particularly fascinated by what I learned about Teresa Kretzer and Savilla Miller. These two young women were both from big, established German-American families in Sharpsburg. They grew up on the same block in a small village. And yet, when the war came, their politics and loyalties were different. The Kretzers supported the Union; the Millers, the Confederacy. And both Savilla and Teresa took risks while actively supporting their beliefs. After I decided to fictionalize their stories, I dug into more detailed research. Teresa is remembered for hanging a huge American flag over Main Street, much to the consternation of her Secessionist neighbors. When the Southern army arrived she saved the flag from destruction by hiding it in the smokehouse. Several people left accounts of Teresa and her flag, and Teresa was interviewed as well. Then the project came to a halt. I knew much less about Savilla. 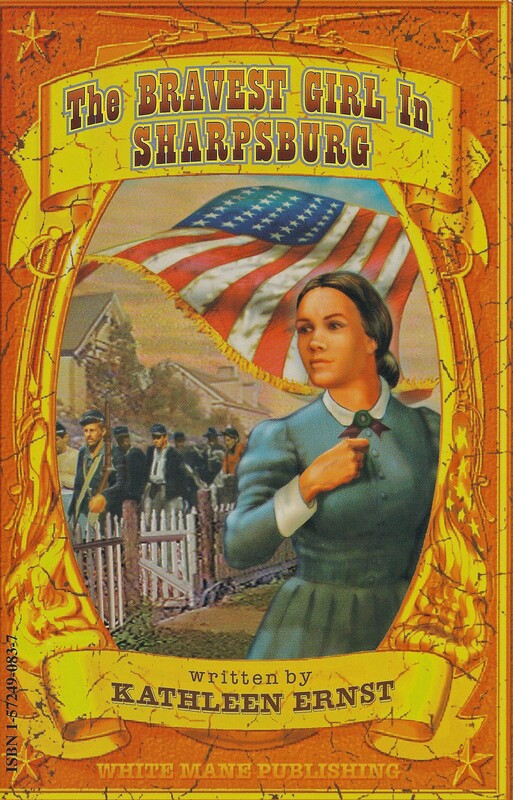 A young Maryland officer serving with Stonewall Jackson left a wonderful description of Savilla standing on her front steps while Confederate soldiers retreated through Sharpsburg, dispensing water amidst falling shells. But I had nothing else. Then something…well, interesting happened. I made one final research trip to Western Maryland, without turning up anything new about the Miller family. My last stop was the Antietam National Battlefield—just to say hi, since I had long since worked through their archives. As I was getting ready to leave, I mentioned to one of the historians my frustration about the lack of more detailed information about Savilla Miller and her family. “Well,” he said, “a collection of letters from the family was just donated to us. Want to see them?” As I recall now, someone had found the letters at a garage sale years earlier, and had always intended to donate them to the National Battlefield. The donation didn’t happen until right before I gave up on finding personal insights about the family. The letters gave me shivers, particularly one that I think was written by Savilla. It talked about how the war had made old friends feel like enemies—the theme I wanted to explore in my novel. Unfortunately, Savilla Miller’s house is no longer standing. It was torn down years ago, and replaced with a gas station. 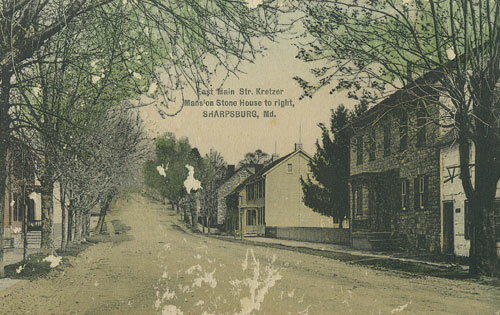 The postcard below provides only a hint of what the street looked like before the Miller home was demolished. The big stone house on the right is the Kretzer House. Beyond it is the large side yard, then a frame house…and beyond that, you can just see the edge of another stone house. That was the Miller house. These two families, with such differing points of view during the Civil War, lived very close to each other. The Kretzer House is still standing, on Main Street in Sharpsburg. It is a private home, but if you visit Sharpsburg, you can stand on the sidewalk and imagine Teresa hanging her flag from her bedroom window. The smokehouse where she hid the flag is visible from the sidewalk. The smokehouse is the small white building behind the fence. 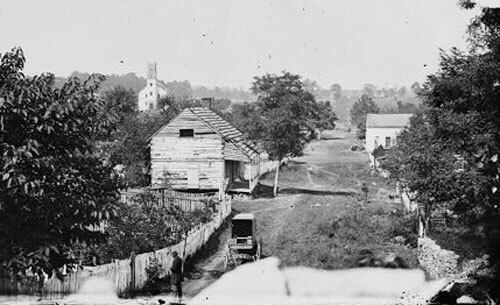 Historical photographs provide a good sense of what Sharpsburg looked like during the Civil War years. It was a rural village, with rutted dirt roads; a place where many people kept cows and chickens in their back lots, and tended big gardens. 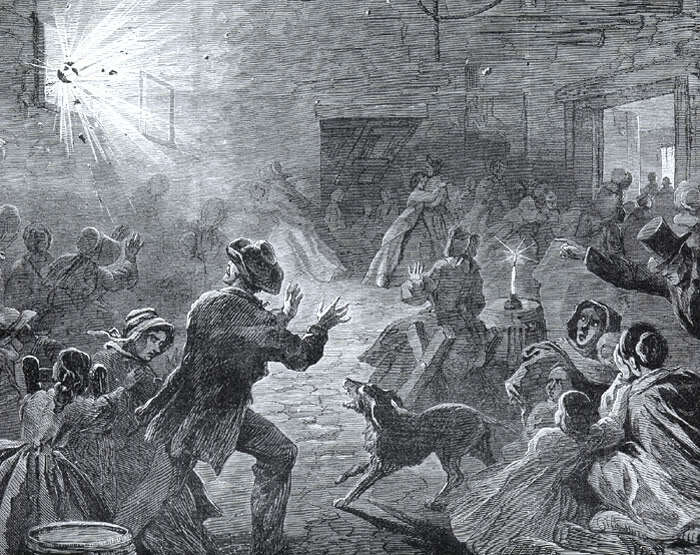 If you want to learn more about what civilians experienced during the Battle of Antietam Creek—or The Battle of Sharpsburg, as the Confederates called it—try Too Afraid to Cry. 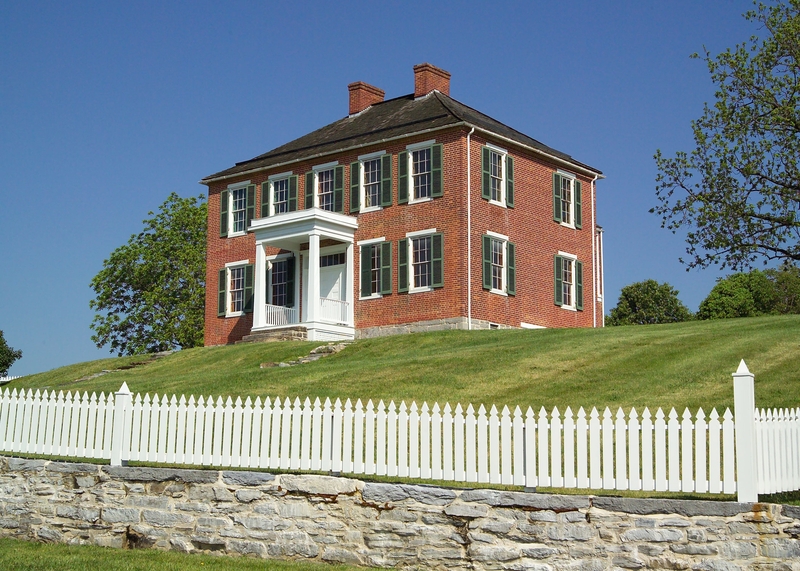 And if you have the opportunity to visit the Antietam National Battlefield, be sure to stop in Sharpsburg, too. Take a walk down Main Street. Look for the still-visible signs of shell damage on some of the old homes. And try to imagine yourself back to the war years in this small border town.